We are big fans of Korean flavors in the Gray household, because of our time spent living in South Korea. I try to find any way to incorporate the iconic Korean fermented chili paste, Gochujang, into our weekly menu. It is rather spicy but one way to round out the flavor is by using a sweetener such as honey or rice bran syrup. The recipe for this dish was requested a few times on Instagram and has been posted on www.thefeedfeed.com but I thought I'd share it here as well. You can definitely substitute with salmon or any other oily fish such as mackerel. In a small bowl, add kochujang, honey and parsley, stir to combine and set aside. Heat a 12" non-stick skillet to medium-high. Add butter and garlic and cook for 1 minute until melted and just bubbling. Place trout in pan skin side down, making sure that every surface of flesh is touching the pan. Cook for 3-5 minutes and flip. While the skin side is cooking (3 minutes), use a marinade brush to spread kochujang mixture evenly over the flesh side of the trout. 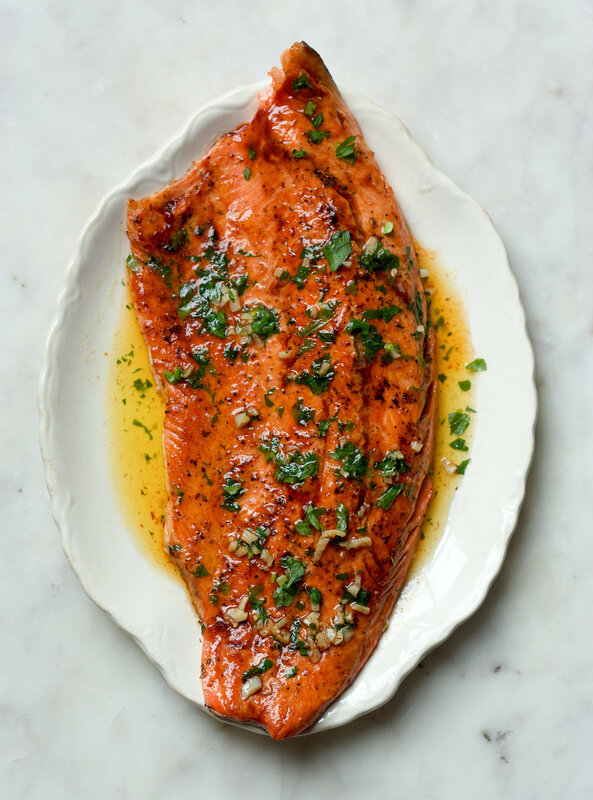 Remove pan from heat and place trout under a moderate broiler for 5 minutes. (Alternatively, flip the fish over once more and cook for 1-2 minutes just until the marinade caramelizes slightly). Place on a serving dish along with any pan juices.